THE SCHLAGER SYSTEMS: THE SANNA NIELSEN INTERVIEW EXCLUSIVE!!!! Swedish schlager diva Sanna Nielsen has very graciously given The Schlager Systems an exclusive interview! Sanna has performed in Melodifestivalen several times and her new album '11-22' spans her amazing 11 year career. 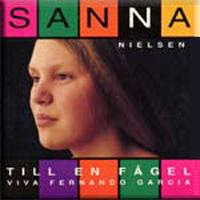 Q. Sanna, although you are still only 22, you have been around the Swedish music industry for over a decade, how did you come to release a record (till en fogel) so young? Sanna: I was 7 years old when I entered the stage in a singing competition. I loved it so much that I wanted to do more of that. And when I was 10 years old I did my last competition because the band that played with me they recorded me on a tape, that I didn't know of and sent that to my mentor and dear friend today, Bert Månson. He received it and after a while he called me at my home in Edenryd and asked me if I wanted to come to his studio and sing for him. I was thrilled so me and my family went to his home and I got the chance to sing for him. He said to me that he had a song that noone had recorded, and he asked me if I was interested to do that. I didn't really know what was happening, and my parents where really carefull. ANyway I got the chance to sing on a tv show called Cafe Norrköping, and I sang that song that Bert had written which was Till en fågel. A few months later I got a record contract! Q. Was fame difficult to come to terms with at such a young age? Sanna: It wasn't actually. Although I can admit that I didn't really know what was happening. I was just a little girl who wanted to sing, and got to do that. That was an amazing feeling. And I never saw myself as a famous person. That could also depend on the way that we worked. It was very important to take it slow for me in the business, cause school was my main thing. It was very important to both me and my parents that school would come first so I sang and toured on the holidays and sometimes in the weekends, just as my friends had their "jobs" on the holidays. You can say that it was a hobby for me in a very long time! Q. We really think you should have won with 'Vågar du, vågar jag' at this year's Melodifestivalen! We love schlager and it is a fabulous track! Were you disappointed not to be going to Helsinki? Q. Who are your musical heroes? Sanna: I listen to different kinds of music, but the one singer that I love the most is absolutely Celine Dion! She is great! I went to Las Vegas last year and saw her show A new day... and i was overwhelmed! She sang so great and had such a feeling within her voice that I started to cry. It really moved me! I get a lot of my inspiration from her. Q. Have you any plans to launch yourself internationally? We would love to see you here in the UK! Q. You have a fantastic voice, do you enjoy performing live? Sanna; Thank you=) I LOVE performing live, that's what I want to do the rest of my life! I feel so very secure and "home" when I am on stage. And when I see happy faces in the audience that makes me so happy, cause I feel then that they see how much I love this, and that they are a part of that and enjoys it! Q. What your most memorable experience as a performer? Sanna: oh, wow! That's a big question. I've been in this business for 11 years and I have a lot of great memories. I know that my "first dream" in this business was to take part in melodifestivalen. I remember when I saw Carola winning with Fångad av en stormvind in 1991. I think I was about 7 years old or something. I remember I said to my mom and dad.." I also want to stand on a huge stage like that and sing..." and when I actually got the chance to take part in that event 2001 with my song "igår idag" I was a little bit chocked. I didn't think it was possible for me to take part in that competition. But of course I was so happy to have gotten the chance to do that. I learned so much from that competition that year. It was so much people around us every step we took, and that was a lot to deal with but at the same time a fun experience! But the greatest thing was of course to stand on that stage, which had been my dream for so long. We stood there and sang for THREE minutes only.. but it was totally worth it. It opened up so many doors for me! Q. As an artist, who would you most like to work with and why? Sanna: hmm.. I have to say Celine Dion (you can dream, can'y you? *smile*) That would be such an amazing experience. I mean, when I listen to her at home I almost analyze her vocal and the way she sings and learns alot from her by that. So I would really learn something from her If I got that chance, and I would be so honoured of course to do that. Another one I would like to work with is Josh Groban. An amazing voice!!! Q. Your album '11-22' has been very successful, what's next for Sanna Nielsen? Sanna: I'm very proud of this album which contains songs from my early career to where I am today.This summer I will do my own concerts in Sweden. Also I am doing a tour with my dear collegues Sonja Alden and Shirley Clamp. We go under the name "three S" and we are touring around the country with about 15 concerts. I am so looking forward to that! We have also been giving the great honour to sing to our Princess Viktoria on her birthday the 14th July which is going to be so fun! Sanna: hmm.. I don't kow yet. I can admit that I have only heard one song, and I don't remember what country, but the singer was great. She had a big wounderful voice and sang a ballad and I love that! Q. If you weren't one of Sweden's most successful young stars, what would you be doing instead? Q. You are always incredibly stylish, who designs your clothes? Sanna: oh thank you!! 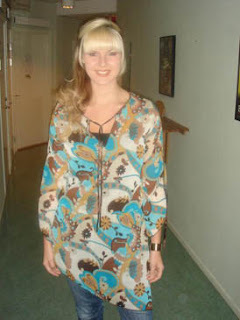 Well I love clothes and Thomas Malmros is the designer in Sweden that I got to work with this year in melodifestivalen. And I'm very proud of that outfit and he as well as the stylist Eva Lind helped me to find clothes for those weeks in melodifestivalen. We went out and looked for them together and that gave me so much inspiration. Q. Do you like to party or are you a girl who likes to be at home? Sanna: I think I'm a little bit of both! I love to go out and dance with my friends and have a good time. But I don't do that very often since I work a lot! And when I work it's very important for me to get my sleep and that I am in a good shape vocally. Then I also love to be at home spending my free time with my family, maybe go to the cinema and relax! That's really therapy for me! Q. Can you cook? What is your favourite meal? Sanna: I learned to cook just 4-5 years ago, i mean really cook, not just macaronies or something like that. Me and my boyfriend love to make dinner together. It s an opportunity for us to really hang out actually! We both love asian food, and most Thai actually. So we make a lot of thaifood, green curry, red curry, wok! Spicy! Q. You have a lot of support from fans in the UK; do you have a message for them? Sanna, thank you very much for your time. We wish you continued success in the future and we love you dearly. Keep up the schlager!! !